Another year, another milestone for SAP S/4HANA! Today marks the general availability of SAP S/4HANA 1809. Since our 1709 release, we have developed a vast number of innovations, which continues to support our customer journey to the Intelligent Enterprise. 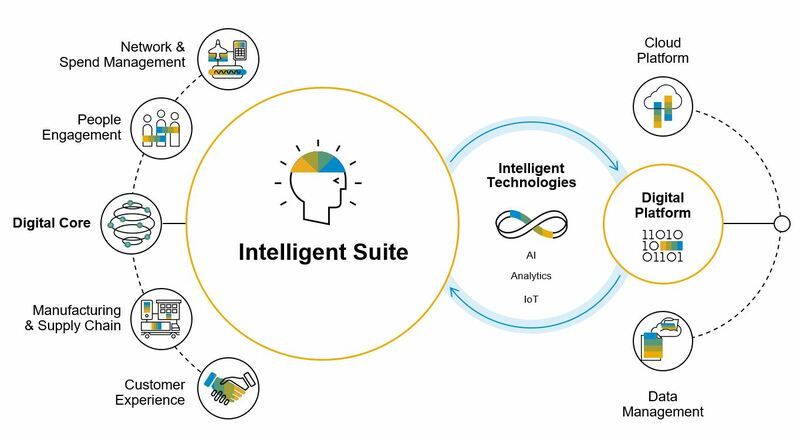 In this blog, I will share our vision of the Intelligent Enterprise, shed a light on the foundation which builds the basis for it, and the tools which support the transition to SAP S/4HANA. Moreover, I will introduce some of the highlights which our latest release SAP S/4HANA has in store for us. In this listed video you can gain a first glimpse of what you can expect from our 1809 release of SAP S/4HANA in a different format. The Intelligent Suite will retain the modularity and flexibility of independent solutions while delivering a suite experience. Scenarios are business-driven and integrated, intelligent, and extensible. We embedded intelligence to deliver unmatched business value in each of the scenarios. Additionally, we enforce reusable business services and integration through data sharing via our SAP Cloud Platform. Partial data records enable easy onboarding and configuration experience. Intelligent Technologies will help SAP Applications differentiate while at the same time natively comprehending the context of the business application. This includes higher-order intelligence with many scenarios oriented along business outcomes and relevant to lines of business, feedback mechanisms leveraging IoT and business networks as data sources for training feedback, as well as actionable insights in order to derive connecting insights to strategic decisions via a consistent User Experience (UX). The Digital Platform will offer the best-in-class runtime experience to users. And development experience to SAP and non-SAP developers alike. With the Digital Platform we allow for a unified integration for processes as well as data, dynamic scalability based on Cloud-native principles for all new developments, and an ecosystem success with the richest business content. We want to cover all data processing needs by leveraging data-driven applications, and new services and innovations shall be obtained via the digital marketplace, a modern consumption model. What is the foundation for a digital core? How can we add intelligence to our digital core? Automation of business processes: We strive for an automation of 50 % of all ERP business processes within the next three years. This automation mainly addresses companies´ bottom lines and helps saving costs. This release again brings new and improved tools that will help scale the adoption of SAP S/4HANA. SAP Readiness Check: You can use the Readiness Check before you are planning to convert your SAP ERP system to SAP S/4HANA or upgrade your SAP S/4HANA system. The tool which can be accessed via the SAP Support Portal summarizes the most important aspects for planning a conversion project in an easily consumable way, e.g. simplifications, custom code, business functions, add-ons and transactions. SAP S/4HANA Migration Cockpit: This cockpit provides predefined migration content. Speeding time to value, it facilitates and accelerates customer data migration. In addition, customer-specific migration content can be flexibly included with integration of customer-built objects and customer-specific enhancements to SAP standard objects. SAP Transformation Navigator: This self-service tool gives guidance in all industries across all lines of business. It reflects customer business priorities and IT strategy. For the recommended products, we inform about transformation services, integration, and impact on license agreements. Quotation Conversion Rates is an innovation in Sales and Distribution which truly delivers on the promise of an intelligent ERP. As an internal sales representative or a sales manager, you can use Quotation Conversion Rates to track to what extent your quotations are being converted into sales orders before expiring. By leveraging machine learning capabilities, you can gain predictive insights into quotation conversion by comparing actual and predicted results. The Quotation Conversion Probability (also known as Order Probability) is the probability that a quotation item will be converted into a sales order item. The probability, expressed as a percentage, and net value of the quotation is used in order to calculate a total expected order value. In Manufacturing we’re introducing Demand-driven replenishment. With the demand-driven buffer level management, you can plan and manage supply chains much more efficiently. Providing decoupling points with strategic stock positions, manufacturers can avoid the so-called “Bull-Whip-Effect”, where the variations in demand increases as you move further up the supply chain from customer to supplier. Moreover, in inventory management, we included intelligence by leveraging predictive analytics and machine learning for decision support. Finance as well has quite a few intelligent innovations in store for you, for example predictive accounting. When a sales order is confirmed in the system, this is not recorded in accounting until goods have been delivered and the invoice has been sent. With the predictive accounting functionality, based on the sales order, a predictive goods issue and a predictive invoice is registered. This will initially be supported for selective sales processes. Many details can be found in a our Finance expert blog already. Last but not least, we’ve also developed many new use cases for our digital assistant, the SAP CoPilot. The SAP CoPilot allows you to communicate with SAP S/4HANA using natural language via voice or text, and it is a first big step to deliver a hands-free ERP. With the SAP CoPilot, you can ask the system, for example, to show sales orders for a specific company from this week, to show standard orders changed by a specific person, to show sales orders with a specific customer reference. In Procurement, the SAP CoPilot enables Smart Buying by creating purchase requisitions using natural language. This is just a list of selective innovations which we’re releasing as part of SAP S/4HANA 1809. If we’ve caught your interest, there is a lot more information out there for you to consume.